This story comes from the July 1952 issue of Adventure Magazine. The author, George C. Appell was very prolific in the pulps from about 1944 to 1957 (which was pretty well past the heyday of the pulps). He wrote in many genres but mostly westerns. 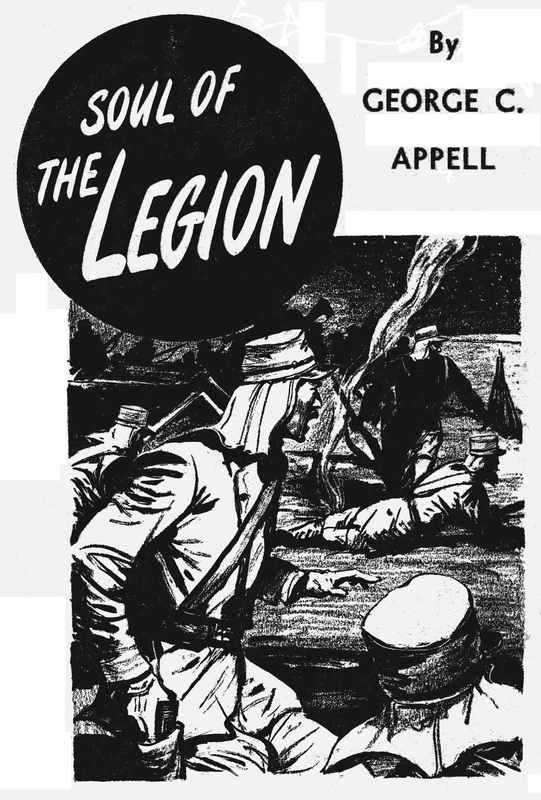 Soul of the Legion is surprisingly on the bloody side and the descriptions of various Legionnaires and Bedouins getting slain or grievously wounded are pretty grim. The story is about a column of camel mounted legionnaires attempting to make a forced retreat to Fort Flatters after rescuing several civilians from hostile Bedouin tribesmen. Harried by relentless attacks and skirmishes the column also has to contend with incompetent leadership and secret vendettas among the officers. This situation rambles on for several pages without much plot development but lots of action and the conclusion seems to be a bit sudden. Also, although the fighting takes place in the Sahara, one of the hottest places on earth, the desert never presents an obstacle. Overall Appell provides really good story telling but not a great story. Thanks again to Eugene for providing this story. Hi Jack, thanks for posting the story. Just to let you know, when I tried to open the story in the e-mail link it did not come up. Only by opening the website and opening the link from there was I able to retrieve the story and read it. It must be some Word Press error. I don’t send out any update emails to followers. Those are generated automatically by the blog program. I’ll see if I can find what the problem is.